Joni B. Cole leads creative writing workshops. Her book, Toxic Feedback: Helping Writers Survive and Thrive is “strongly recommended” by Library Journal. She is the author of the personal essay collection Another Bad-Dog Book: Essays on Life, Love, and Neurotic Human Behavior. Cole founded the Writer’s Center of White River Junction, New Hampshire, serves on the faculty of the New Hampshire Institute of Art, and teaches at the Master of Arts in Liberal Studies at Dartmouth College. She’s been nominated for a Pushcart Prize and a United States Artist Fellowship. 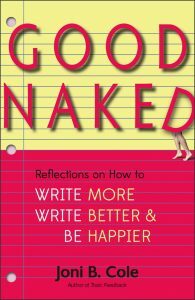 Good Naked is an often self-deprecating and honest look at the pitfalls and pluses of being a writer in a world that is increasingly comprised of people focused on soundbites or social media. In an often humorous tone, Cole takes on the insecurities and procrastination of many writers (“by most writers I mean all but four” (6)). Her flippant tone, beginning with the chapter “First Things First (Not)” where she personifies a great idea: “’I thought you loved me,’ your Great Idea nags. ‘I thought you were all, like, I want to spend time with you’” (3). Although many of the ideas in the book are familiar, like the interference of life responsibilities, despair, perfect writer friends who seem to publish without effort, and overcoming the desire to do anything else (she even mentions checking for ticks), her casual and funny writing style keeps the book moving. Interspersing neuroscience—”neuroscientists have determined that humans are hardwired for negativity, meaning our brains, similar to juvenile delinquents, make a point to go out and look for trouble” (27)—with maximizing positive moments even as we “trash talk” ourselves, she posits that we can rewire our brains by focusing more on the good stuff like sunsets and kindness. This is, of course, a simplistic viewpoint for many of us though some people do seem to have optimism as a default setting. Is this perspective necessary for a writer? What follows seems similar to creative visualization, which gave birth to a whole lot of self-help books and the slogan “Dream it, Do it!” The ultimate message of developing tenacity and a belief in ones’ work is necessary for writers. That may be cultivated by honest improvement and the discipline of sending work out and garnering some acceptances. The short chapters serve as humorous meditations for writers. Get out of your own way, maintain your optimism and surround yourself with people who believe in your writing and in your ability repeat throughout. There are nuts and bolts suggestions that longtime writers and wannabe writers might find helpful, especially the blunders well-intentioned friends may make that can derail a writer. There aren’t a lot of writing books that feel like a conversation with a witty friend over a cup of espresso and a delicious homemade muffin at your favorite café, but this is one of them. While there are suggestions to take to a workshop or class or to call up the next time you’re uninspired in front of the blank computer screen, it is, in the end, the humor and conversational tone of this book that won me over. Writers need to hear that the world will sometimes mock their stories; bad teachers will doubt that they have any innate talent, and publishers will send them curt rejection letters. In spite of all of that, this book reinforces my belief that writing brings out the best self, the one that won’t look away from hard truth and necessary stories. Lisa C. Taylor is the author of four collections of poetry and the short story collection, Growing a New Tail. Both her poetry and fiction have been nominated for the Pushcart Prize and she won the Hugo House New Works Fiction Award in 2015.